This is a single door station with 7″ Colour Video Display (Non SIP) IP Intercom with WiFi and Power Over Ethernet. Push technology allows calls to Smart Phone App even when out of WiFi range. Add multiple extension panels throughout the home. We recommend a PoE switch to power the intercom. Please add below. 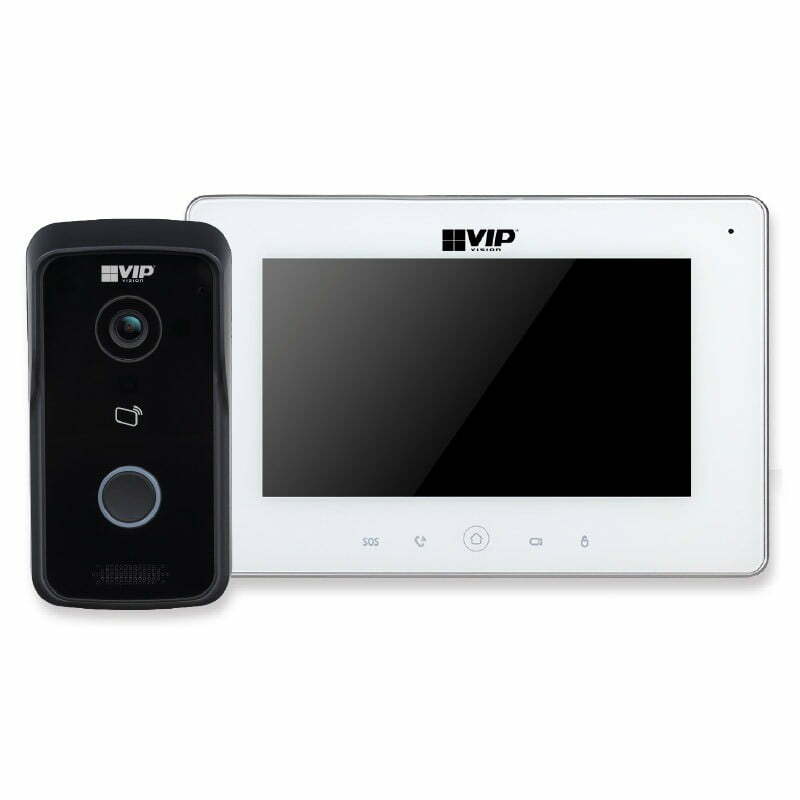 The VIP Vision™ Video Residential Kit – IP Intercom with WiFi is an ideal single monitor/door-station video intercom solution for residential applications. The system comprises of a compact, gloss black door station and a 7” touchscreen white indoor monitor. Connect the door station and monitor using supplied Cat5e cable (30m) or remotely via WiFi or individually to the internet router. The door station features a 1.3 megapixel, low-light camera. The intercom kit integrates with most electronic door strikes and sensors. Download the Free App for Android (gDMSS) or iOS (idMSS) and connect using a Q Code within the door station. Once connected you can receive calls, open the door / gate (requires electronic lock / strike), and monitor the intercom from your smart phone. This is a free service, no subscription required. We provide full telephone, Skype, or remote desktop support to ensure your system is configured and running to your satisfaction. There is no other vendor in the market who will work with you to ensure that your intercom is setup and running correctly, even if you have no technical experience. We are a support business first and we won’t let you down. We are always here and ready to support you. Call us to discuss your ideas and allow us to steer you in the right direction. We recommend you use cables wherever possible with your intercom. The rapid increase in devices connecting to WiFi, especially now that video streaming is common, has made WiFi difficult for intercom systems. The need for clean WiFi is becoming impossible as the 2.4GHz band travels through walls and floors including from the neighbors. This creates large amounts of noise which particularly affects real-time communications (as different from streamed video which can be buffered and delayed). If you live in a remote location you may find no issue. We will assist to some extent but we cannot guarantee a WiFi system will work in every home and ask buyers to beware. These systems if cabled work extremely well and it is well worth the extra effort to install with cables. WiFi extenders add extra latency and noise to the system and generally do not assist the situation. The only recommendation we have for WiFi is as part of a Wireless Bridge where the bridge acts like a cable in the air and each end is connected by cable. See this article. The Video IP intercom with WiFi is connected with WiFi (please see above) or alternatively through a RJ45 connector on the rear. Connect the door station directly to the monitor with supplied cat5e cable for a basic self contained intercom system. Note that the remote view App will not function in the direct connection connection configuration as the systems needs to connect to the internet for remote view. Connect to your local network via a router or switch or WiFi to enable remote view. Power the monitor and door station by the included power supplies or by connection to a Power Over Ethernet capable switch. Please contact us to understand your options. See Connection Options Tab above for more information. Monitor you CCTV cameras, integrate security and safety sensors into your display to secure your home. Capabilities of this intercom kit extend beyond the home and into everyday life. Remote connect to your intercom system from anywhere with your Android or iOS device (iPad, iPhone). Answer door bells, unlock your door, take image snapshots and two-way talk – all remotely from your smartphone or tablet. Video is presented as soon as the caller presses the button. Choose to answer the call, open the door or gate, take a photo of the caller, take a video of the call, or ignore. Set DND (Do Not Disturb) mode on the display panel with start and end time and nominate specific days of the week. View CCTV cameras from the Display Panel. Call other rooms (extension panels) and speak with other users. Monitor your door station from anywhere you have mobile coverage. The intercom display panel and door station may be connected in multiple ways. We have found this causes some confusion so have provided additional information below. It is important to note that each device may only connect via hardwired OR WiFi, not both. This means that you cannot connect the door station directly to the monitor with cable and the door station to the internet router via WiFi. The devices are single connection only. If you need to connect to the internet the door station must connect only to the internet router (or a switch/router connected to the internet router) via WiFi OR cable. In this scenario the intercom system requires an internet connection to enable the intercom signal to be pushed to the online server. The door station may connect to the internet router through WiFi or hardwired. The monitor may connect through WiFi or hard cabled. Both must have a connection to the internet router. When using WiFi the devices must be powered locally with 12VDC (not supplied). If hardwired you may power locally or via poe from a poe switch. In this case the options of scenario 1 apply. In addition you may also direct connect the door station and monitor with the included cable, bypassing the existing network (WiFi or cable). You will need to power both devices locally in this case or use poe devices. The essential information here is that there no internet connection and therefore no remote view.